It only takes a few seconds of viewing to understand that this video means business. We’re treated to an incredible drone shot sneaking through the woods, rising onto the roads at just the right moment to capture a Chevrolet Corvette drift car blast by on the lock stops. A car which is then seen dropping a front wheel off the mountain road it’s snaking around. Wow. 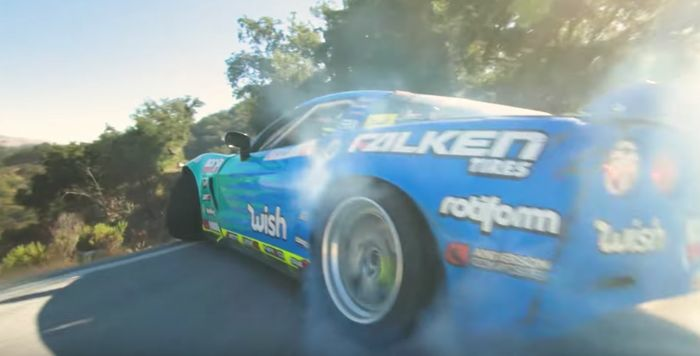 The driving from Matt Field - who’s currently campaigning this 1000bhp+ Corvette in the Formula D series - is awe-inspiring, but we’ve been blown away by the filming too. For those aerial shots, the crew from HeatWaveVisual surely will have needed to strap a camera to a racing drone, given the speeds involved. It’s bonkers to watch. Now the video has been sufficiently hyped, it’s time for you to sit back, relax, and enjoy three minutes and 27 seconds of jaw-dropping footage. If you’re having a bad day, this might just fix it.